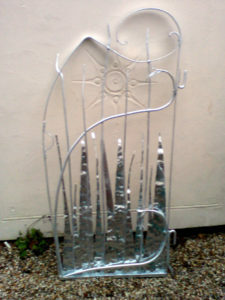 The last stage for the gate was to add vertically standing leaves to the base. These partly block out gaps, but are mainly decorative, giving the gate structure and weight both literally and figuratively. 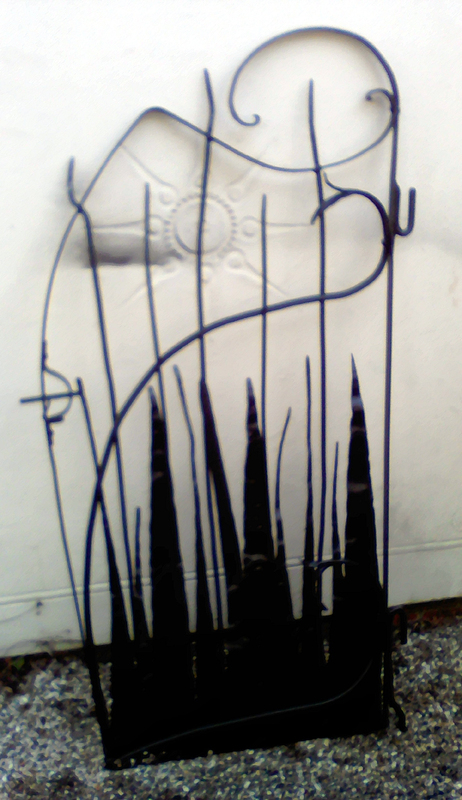 Having finished the gate I decided to get it galvanised. This is a process where the metal is zinc coated to protect from rust. Any scratches are covered by zinc oxide before any iron oxide can form. There is a great galvanisers near to us which I use. They have a minimum weight, so I took the opportunity to have a table I made in the summer from an old gear wheel galvanised at the same time. 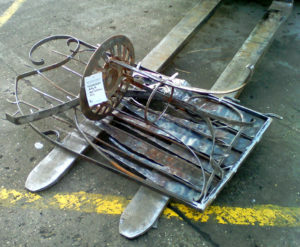 On the left is the pile of bits ready on the pallet and then the finished galvanised gate. The shiny finish is the zinc. Left alone it would be perfectly protected, but would dull down to a boring grey, just like corrugated iron roofing. This is how it has finished with its silk black painted finish. I will put up more pictures when it is installed, showing the hinges and arch over the gate.